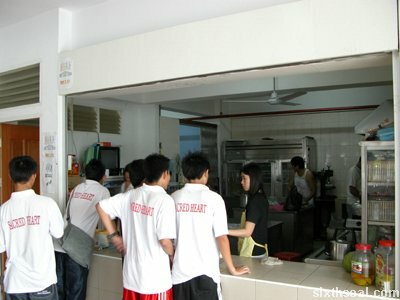 Village Park Restaurant is reputed to have one of the best nasi lemak in Damansara Uptown. The first time I went was a couple of months ago with some coworkers after a meeting and I was amazed by the fresh-from-the-deep-fryer chicken and the piping hot rice. 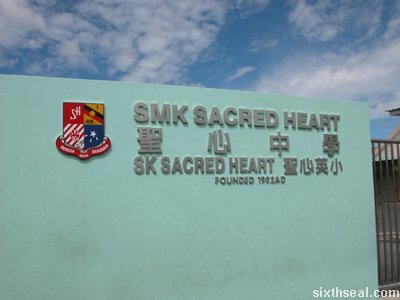 I was determined to go again during my second meeting there. 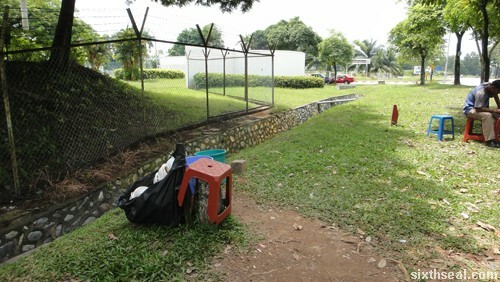 There is a no photography sign but no one was bothered when I took by Sony Cyber-shot TX-5 out and started snapping away. In fact the proprietor asked me what I’m writing for and was very eager to please when I went to pay the bill, smiling and asking if the food was good. I think the sign is a remant of the past when social media wasn’t quite there yet. 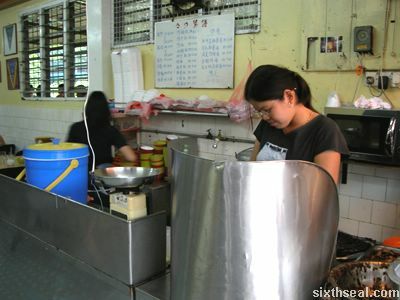 I had the Village Park Nasi Lemak Set (RM 15) which offers you beef, sotong, shrimp and a chicken drumstick cooked rendang style along with all the works that good nasi lemak should have – anchovies, peanuts and half a boiled egg. I neglect to mention the cucumbers coz I’m really not a big fan of vegetables. I also couldn’t resist ordering a fried chicken drumstick (RM 4.70) since I had that during my first trip there and it was pure gold. It seriously doesn’t make any sense to order this amount of food. 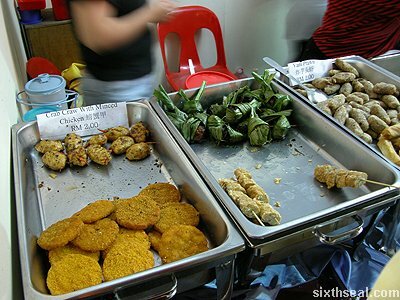 The chicken drum (rendang version) is huge and there are plenty of side condiments. I really liked the prawns sambal – it contains un-deshelled prawns (which I eat wholesale anyway FML) and has a sweet finish. 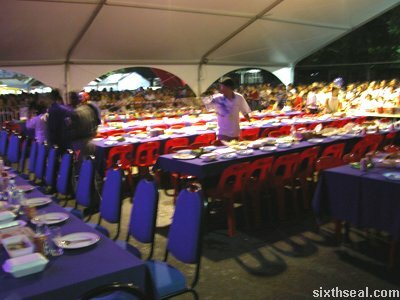 The beef was a bit too tough for my tastes but some portions was very tender with lots of…er, tendons, so to speak. I love tendons. I have a weird taste for bone marrow and other stuff that has that elusive umami factor. The sotong sambal was very good as well, spicy with the chewiness of fresh squid. Wash it down with their signature Our Special Iced Milo Dinosaur (which is ice blended and comes in a more-than-generous, and dare I say it wasteful concoction full of heaped Milo powder that makes this local Frappuccino a great energy boost) for RM 5.20. 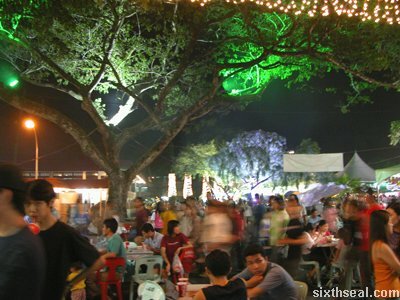 The best thing about Village Park nasi lemak is more than the sum of its parts – is it the piping hot santan infused rice? The crispy anchovies and crunchy peanuts? The oh-so-delicious-but-sinful fried chicken? It’s more than that – it’s the entire package. Needless to say, it comes highly recommended from me. 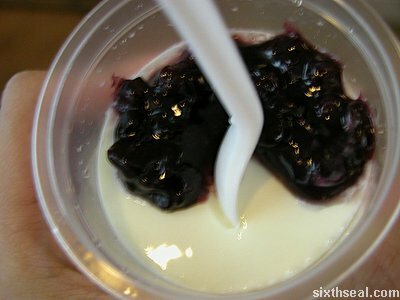 I’ve only had it twice and I’m craving for it already. A lot of places serve cold or semi-warm rice in nasi lemak (a pet peeve of mine) but this one serves it piping hot – just the way it should be. Do ask for extra sambal – it’s their forte. It’s guaranteed to induce a post lunch coma. My stomach nearly exploded from the sheer amount of pure win! 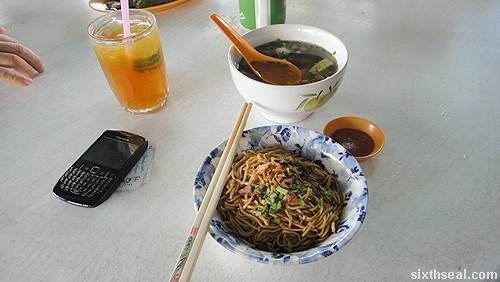 I’m a huge fan of kampua mee and we can’t exactly get the authentic ones in KL so I make it a point to eat this whenever I come back to Sibu. 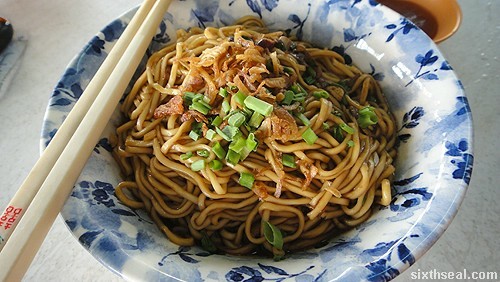 It’s actually just noodles tossed with lard and sprinkled with spring onions, shallots and fried onions but it tastes delicious! 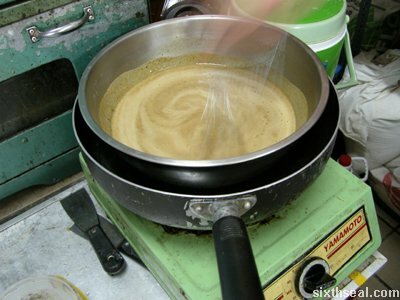 I like mine with soy sauce and chilli – you can also opt for an either or if you don’t want the plain noodles. 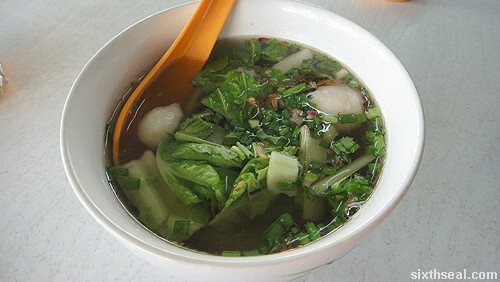 The trick to good kampua mee is in the lard. 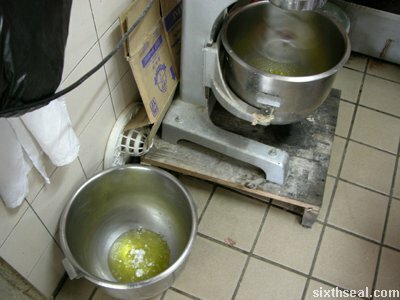 A lot of places switched to vegetable oil instead. 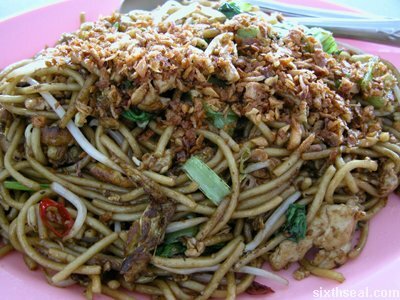 THAT IS NOT KAMPUA MEE! 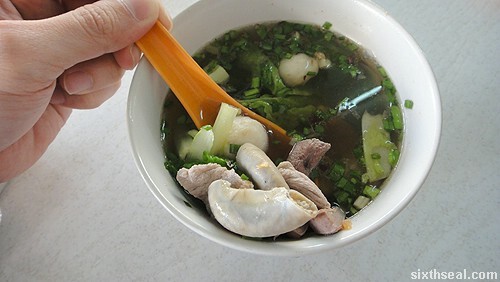 A proper bowl of kampua mee is made with lard. 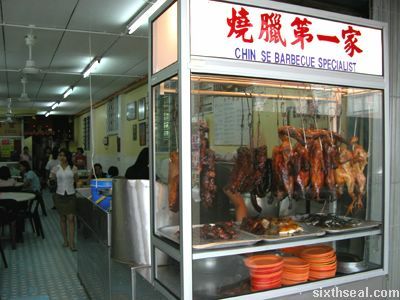 There are also endless customization options – you can have it in soup, with sliced char siew, with pien nuk (dumplings – kinda like wanton) or with a side order. My favorite used to be a side order of pork liver but today I went for the Full Monty (except for tofu coz I don’t like tofu!!!). 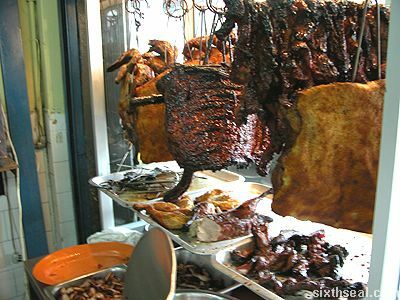 It not only has pork liver, but intestines, meat and various innards from this non-halal animal. My favorite place closed down but this one is pretty good too – the soup was peppery and yes, the kampua is made with lard. I make it a point to check. 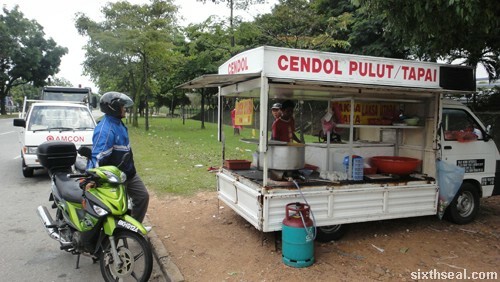 I was driving yesterday afternoon when I realized I haven’t had breakfast or lunch and I was really early so I decided to stop by this roadside stall. 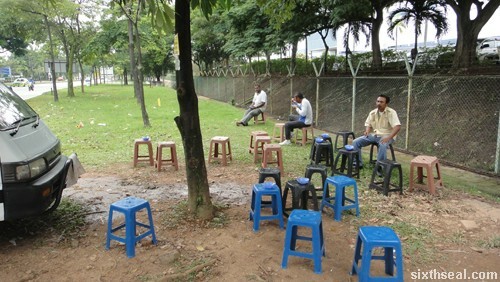 …with plastic chairs for you to sit on, arranged nicely in clusters under the shade of trees. 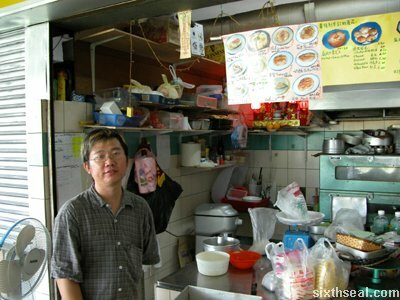 I only had RM 4 in my wallet and I ordered their Laksa Utara (RM 3). It tasted pretty good, probably coz I was very hungry. It had all the right stuff inside – boiled egg, fish pieces and shallots. 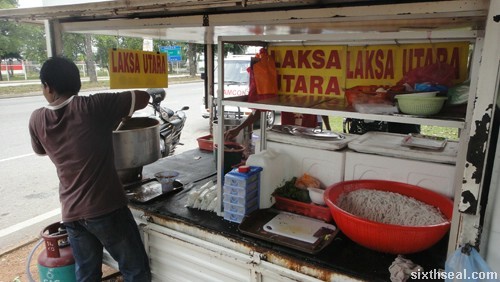 Laksa Utara (Northern Laksa) is asam laksa, sorta, kinda. 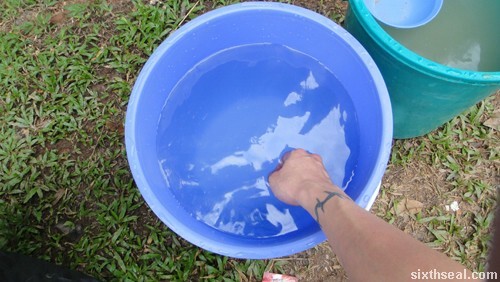 You’re supposed to throw the bowl and spoon in one place and there’s a bucket of water for you to wash your hands in. 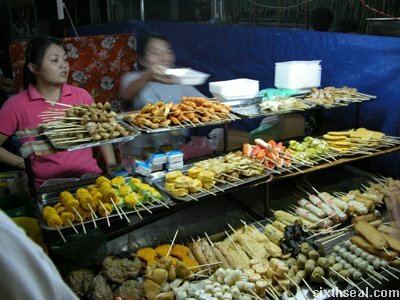 Now tell me this isn’t authentic street food! Alas, I think I used my right hand to wash though. 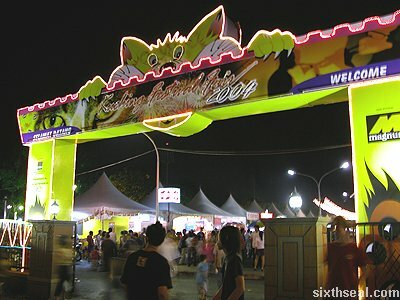 Now, this is pretty cheap considering that I’m used to paying RM 10 for chap fun at my favorite outlet in SS6. However, the pork belly here leaves me wanting (it does not have the liberal hand that shakes the MSG, salt and starch from the good chef at SS6). 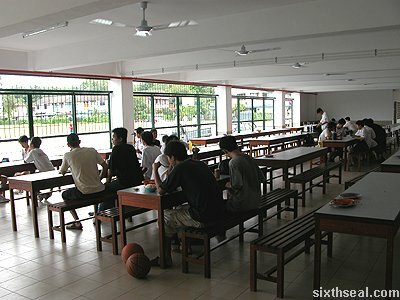 All photos taken with the Sony Cyber-shot TX-5. I had food poisoning after that to boot. Anyway, I will be going to Melbourne tomorrow night. It’s technically Saturday since the flight is at 1 am but for all intents and purposes, it’s Friday night. As usual, I’m flying by the seat of my pants – haven’t packed, don’t have accommodation (fell through due to parental visit), but hey, what’s an adventure if not going to Australia with just my meagre savings without a place to stay? 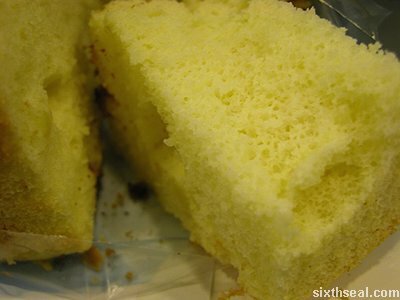 the baked pastry without filling. 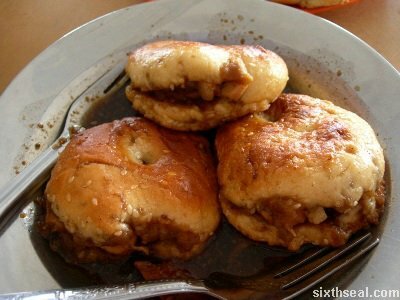 I’ll eat is the gravy soaked meat stuffed kompia. has a full ordering service. 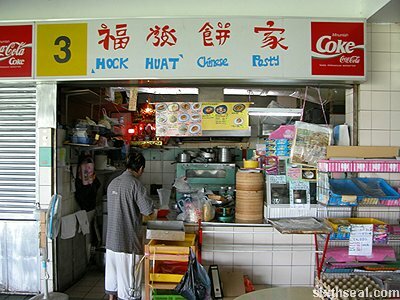 This is my order – Coca Ice and Iban Mee. 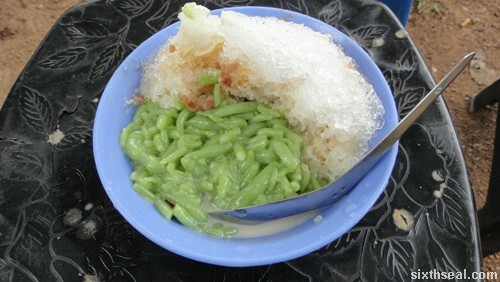 “Coca Ice” turns out to be very dilute Milo but at RM 1.20, you get what you pay for. 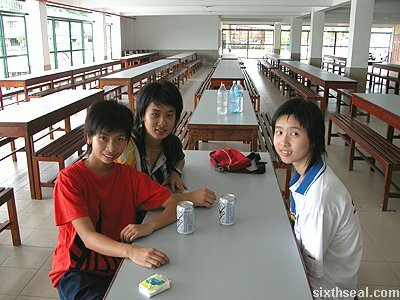 don’t they look rather young for 18? 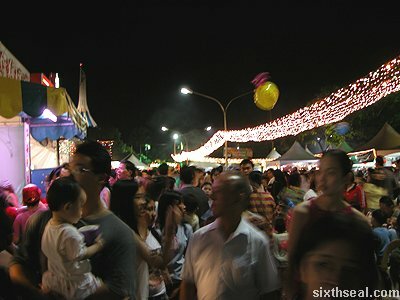 is on the food fest – that seems to be the most popular one every time. and the other with two girls singing on the stage. “love noodles”. It was a feast! 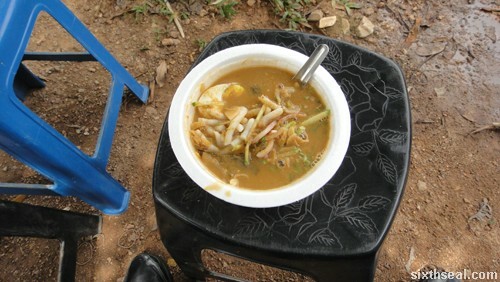 RM 6), and chicken cooked in bamboo, amongst other things. 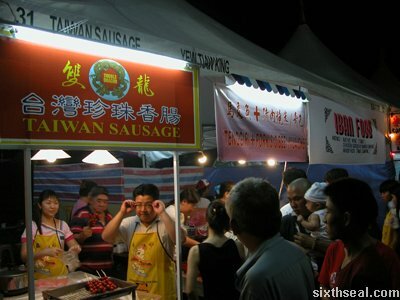 least 4 different stalls selling Taiwan sausages there. 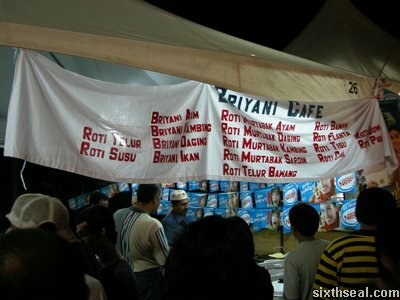 Briyani Cafe offering different rotis, murtabaks and briyani dishes. 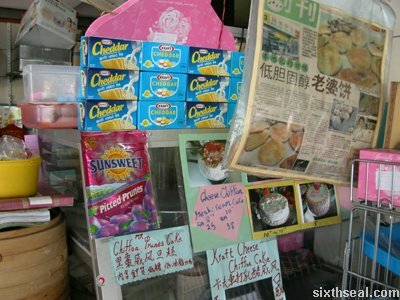 Ching Chen and their Cinta Noodles. 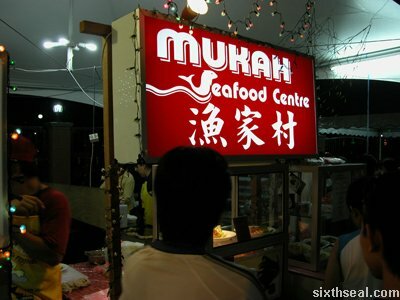 Mukah Seafood Center was there too. 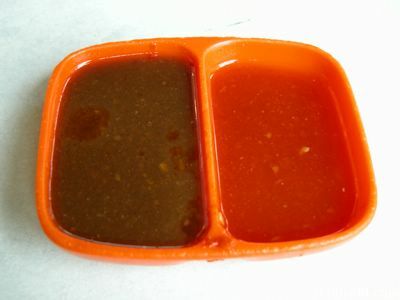 They have umai, a local raw fish dish. 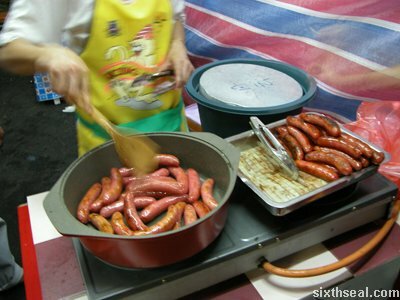 Sausages galore! 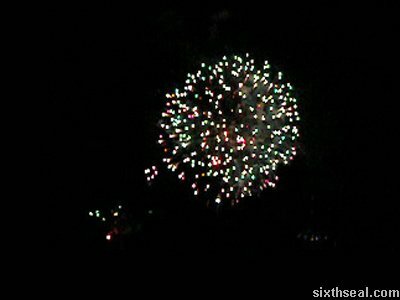 This is the regular ones though. 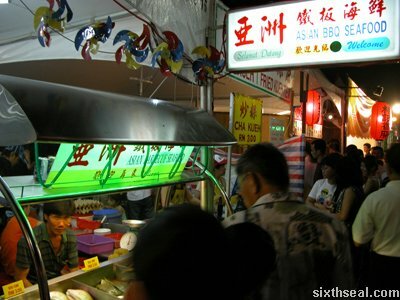 Asian BBQ Seafood stall beside a hawker stall selling cha kueh, fried kueh tiaw and other staples. 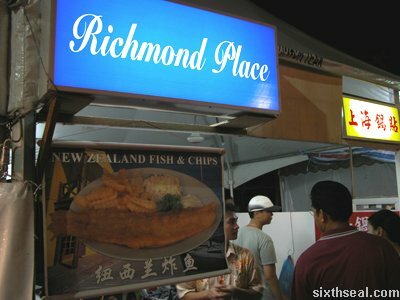 Richmond Place offering New Zealand Fish and Chips. 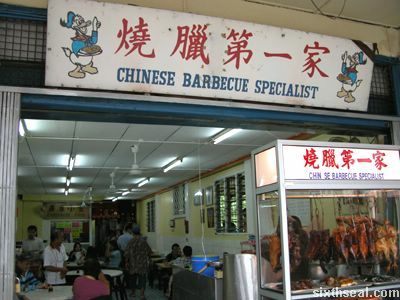 There are also other franchises like Sugarbun and KFC there. 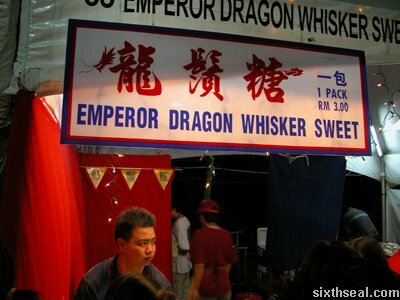 Emperor Dragon Whisker Sweet. It’s those little balls of rolled confectionary. 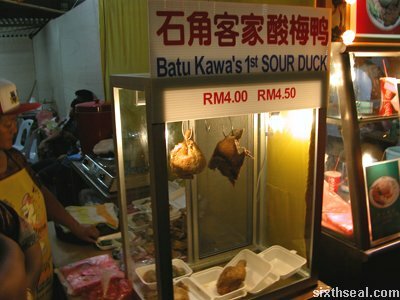 Batu Kawa’s 1st Sour Duck. 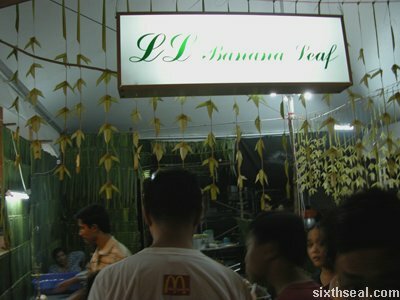 Banana Leaf – offering dishes served on…well, a banana leaf. 100,000 for this Datuk title” club. 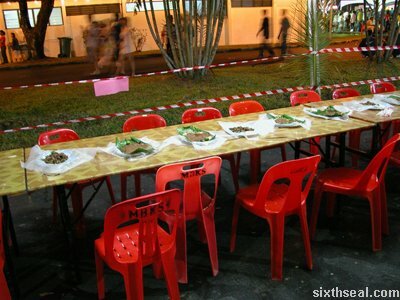 The proles had their own eating competition though. 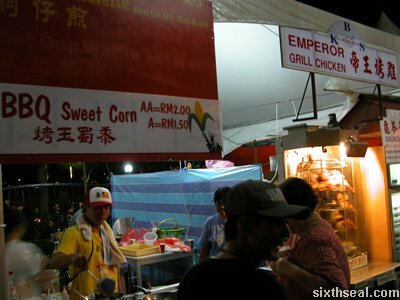 This stall offers a novel twist to the standard sweet corn snack – it’s barbecued. 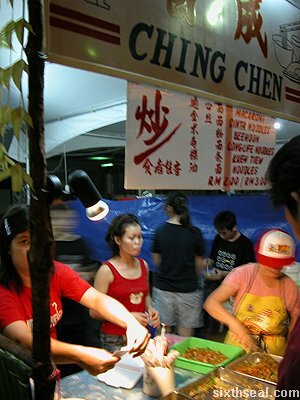 The stall beside is Emperor Grill Chicken. 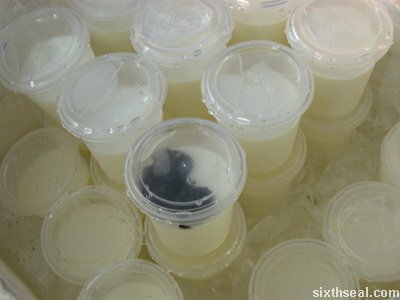 flavored ice cream. 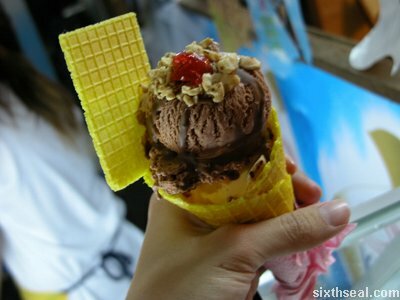 It’s topped with a wafer, a single cherry and nuts. 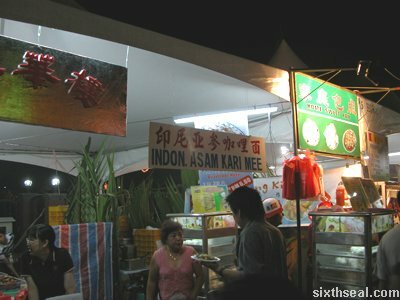 There are all sorts of culinary delights at the fest – this one is Indon Asam Kari Mee. 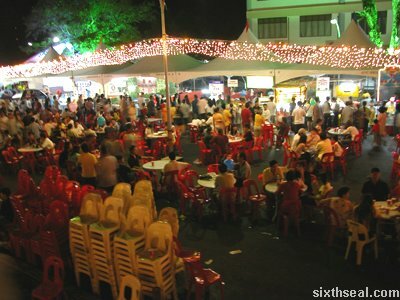 There’s a stall selling paus beside it. 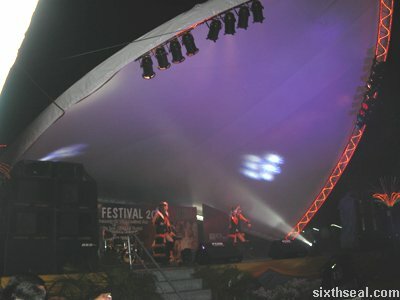 This video shows two girls singing the Sha La La song with choreographed movements on the stage in Kuching Fest 2004.
roads were lined with double parked cars. 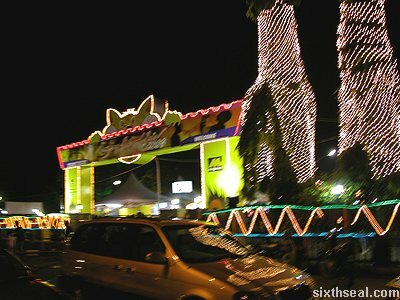 It was worth it though – Kuching Fest 2004 lasts for a month, and you won’t be disappointed if you drop by. 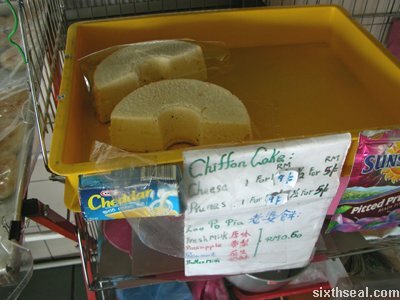 really sells is chiffon cakes. It’s the flagship item. these, since a cheddar cheese chiffon cake does sound rather intriguing. beater preparing this one, which I was told is the first step. disintegrated when I put it into my mouth. Highly recommended! outlet offers BBQ meat only. sauces and a plate of mixed bbq stuff rice. cuts of an unknown origin). 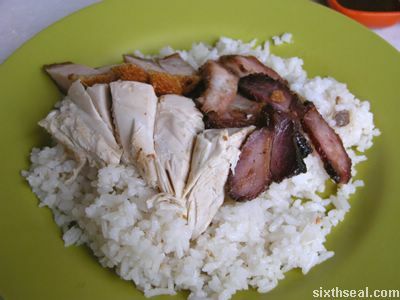 This is all lying on a bed of chicken rice. 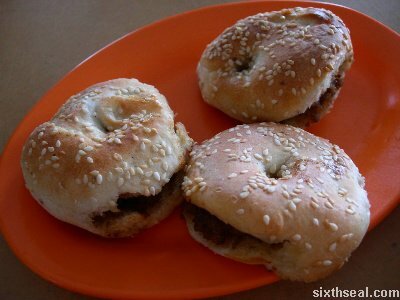 It tastes really good, despite the simple appearance.